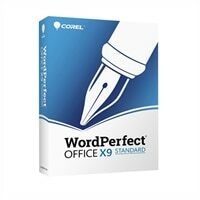 Corel WordPerfect Office X9 Standard Edition is the trusted solution for creating impressive documents, presentations, spreadsheets, and more. With built-in PDF functionality, enhanced Reveal Codes, and eBook publishing, you'll find all the support and familiar features you need to work more efficiently and collaboration is made simple with support for over 60 file types. User-suggested enhancements streamline your most important workflow requirements, making it simple and intuitive to discover the tools to set you up for success in any office environment.